(Bloomberg) -- Russia couldn’t have timed it better. After facing souring geopolitics at its last two Eurobond sales, the Finance Ministry is turning to the foreign debt market just hours after U.S. Federal Reserve Chairman Jerome Powell gave the emerging-market rally fresh impetus. Russia is offering a benchmark-sized 16-year dollar bond with initial guidance in the 5.5 percent area, according to a person with knowledge of the deal who asked not to be identified because the details aren’t public. The ministry is also planning a tap of its 2025 euro-denominated notes at about 2.625 percent. State-run VTB Capital and Gazprombank are organizing the deal. Sberbank CIB also bid for participation, but wasn’t chosen, according to a ministry statement. A year ago, Russia was marketing its foreign debt amid an international scandal over the nerve-agent poisoning of an ex-spy in the U.K. Eight months later, another offering went ahead hot on the heels of a naval clash with Ukraine in the Kerch strait. Both placements were ultimately successful as investors closed their eyes to the geopolitics and concentrated on Russia’s high yields, investment-grade credit score and almost half a trillion dollars of foreign-currency reserves. The current backdrop is rosy by comparison. Emerging-market assets got a fresh boost on Thursday from the Fed’s surprise forecast for no rate increases in 2019. Russia’s currency and bond markets have led a rebound in the asset class this year as the softer policy backdrop and stabilizing oil prices returned the ruble’s carry-trade appeal after last year’s slump. Foreign investors are boosting their holdings of ruble notes and the non-resident share climbed in January after nine months of outflows. The Finance Ministry sold more than $1 billion of local-currency debt on Wednesday, a week after netting its biggest local bond auction on record. 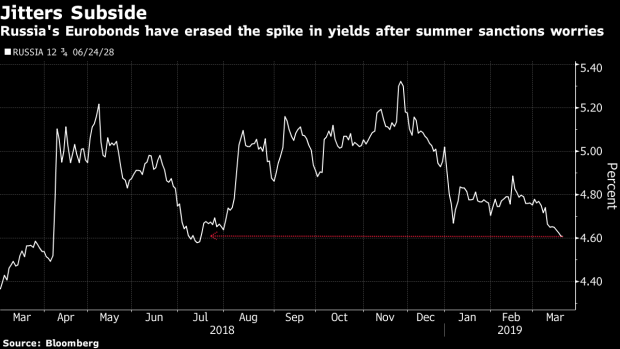 Yields on Russia’s dollar bonds due in 2047 dropped four basis points to 5.27 percent on Wednesday, the lowest since July. In the event of a successful placement, Russia would join a swelling list of issuers this year that includes Ghana, Benin, Uzbekistan, Egypt, Turkey and Saudi Arabia. While the continued threat of sanctions on Russia’s sovereign bonds is keeping some big foreign investors such as Eaton Vance and Manulife cautious, Morgan Stanley said this week it’s “overcoming” concerns about the possible penalties and recommended going long on the ruble. Moody’s Investors Service promoted the world’s biggest energy exporter back to investment grade earlier in the year, citing Russia’s resilience to U.S. penalties. After a placement in dollars or euros, Russia may sell bonds on the Moscow Exchange denominated in Chinese yuan, according to a person familiar with the plans, who didn’t provide further details and asked not to be identified because the deal isn’t public. Earlier, Russian officials had said the issuance may total 6 billion yuan ($898 million). The Kremlin has mulled a yuan-bond sale since U.S. and European sanctions over Ukraine in 2014 locked some of the nation’s biggest companies out of western capital markets. President Vladimir Putin is seeking to cut the nation’s exposure to the greenback and Russia now holds about a quarter of the world’s yuan reserves after a massive shift out of the dollar last year.